This post is sponsored by BabbleBoxx.com on behalf of Alexia. 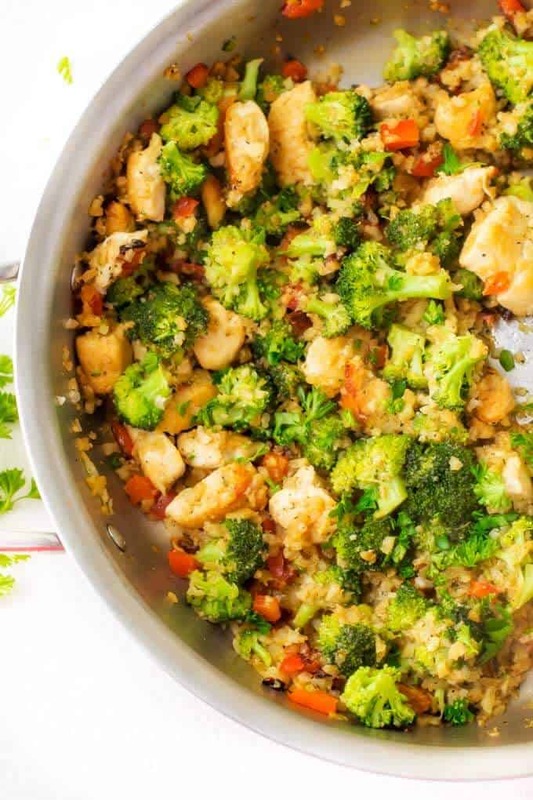 This Chicken Broccoli Cauliflower Risotto is a delicious low-carb meal that comes together in 20 minutes. This creamy one-pan cauliflower risotto is so easy to make and kid-friendly. Today, we are continuing with my current cauliflower obsession. 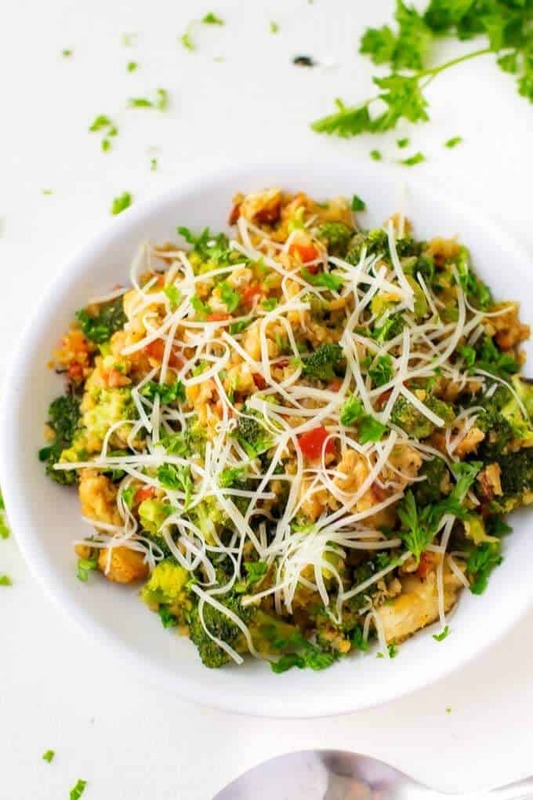 I am always amazed by all the things it can do and today I’ve got a Cauliflower Risotto for you! Guys, this recipe is so easy to make and so yummy. Don’t you love it when you can take something simple and make it extraordinary? That is what Alexia is all about. We have used their product for years because I trust that they use the highest quality ingredients that taste great. They are non-GMO project verified, gluten-free and they use organic dairy ingredients. I was so excited when I learned that we were coming out with premium vegetable sides. You know I love my starchy foods, but I can’t always afford the calories. You can use these starch replacement side dishes with no additional ingredients – they come ready to cook out of the back and are ready in less than 10 minutes. They are also fabulous as a springboard to a complete meal. 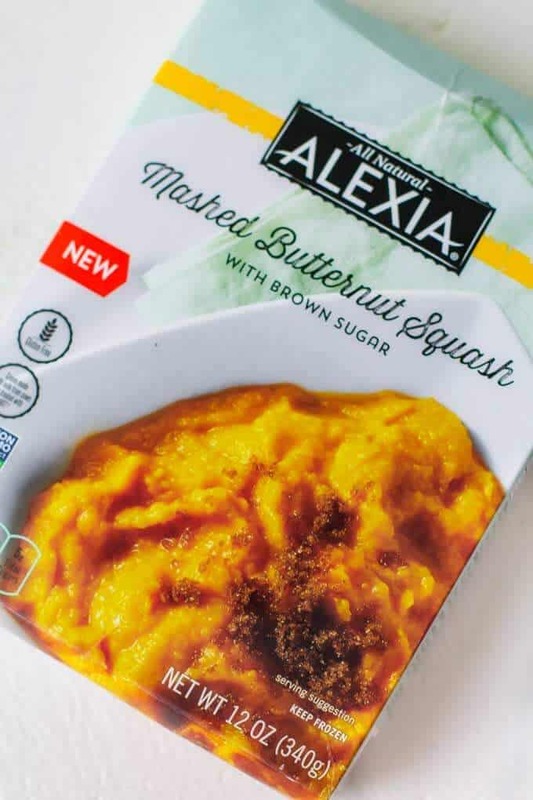 Just in time for the holidays, they Alexia also has Mashed Butternut Squash with Butter and Brown Sugar. This is a decadent twist on a family favorite that is holiday worthy, but easy enough for Tuesday night. You won’t believe how delicious it is. Just a touch of brown sugar and butter create a savory flavor with just a touch of sweetness. You can find Alexia Premium Vegetable Sides at Giant Eagle, Kroger, Meijer, and other fine grocers. 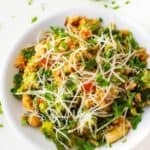 This Chicken Broccoli Cauliflower Risotto is a delicious low-carb meal that comes together in 20 minutes. 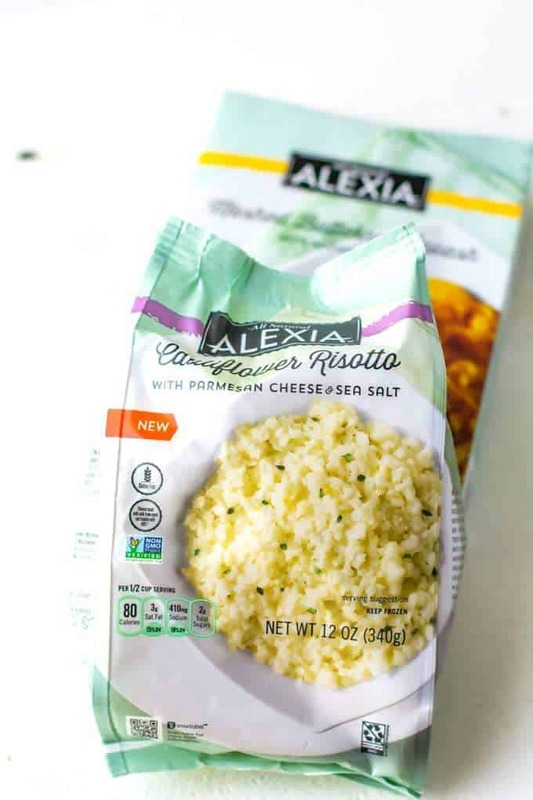 This creamy cauliflower risotto is keto-friendly (10 net carbs) and so easy to make. Add chicken, and cook until browned, about 8 minutes. Add red pepper to the pan and cook for 3 more minutes. Reduce heat to medium. Add cauliflower risotto, broccoli, water, salt and pepper to the pan. Cover. Cook for 8 minutes. I need to get some Alexia in our house! I’m always trying to get more veggies into the kids and this seems like he perfect way to do it. That looks so tasty! I love using cauliflower in place of fairly empty starchy calories. Great idea! This is exactly the kind of dish I love to make when I’m pressed for time. That cauliflower rice is healthy, and it makes the dish faster. That’s perfect for me! I need to find the Alexa brand in my store! Thank you for telling me about it! I had not heard of it before now but it sure looks YUMMY! We love Risotto! This sounds absolutely amazing! I am looking for different sides to make for Thanksgiving. I’ve bookmarked this recipe. I think I will make it for my family. I feel so bad that I have never tried this brand before! It’s really amazing what kind of products they have. I’d love to try both the cauliflower and squash! This looks so good! I have been roasting cauliflower and it would be nice to mix things up a little. I love the Alexa brand but I haven’t tried this product yet, so I’ll have to see if I can find it. This looks so good. I’m going to have to put this on the menu soon. I can’t wait to try it. I hope my family will love it! Alexia is a new brand for me. It looks and sounds delicious. Something I would use a lot. 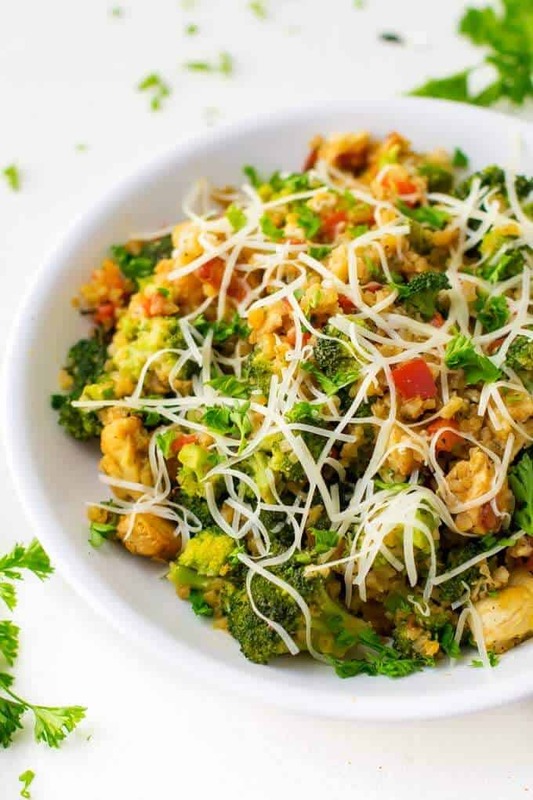 This recipe looks so good even though I am not a fan of cauliflower. I might have to give this a try because I really need some new side dishes to eat that are healthy. Oh wow this sounds really delicious. I love a good risotto. I am going to have to try this recipe out. We are HUGE fans of Alexia products! (I seriously haven’t met a product by them that I didn’t LOVE!) Your Cauliflower Risotto looks absolutely incredible – it just may have to go on our family dinner rotation! that’s the best looking risotto I’ve ever seen. Looks really yummy too. I would love to try it. Thanks for sharing! This does sound like a great alternative. Unfortunately, I do love starches. For me anything with Sea Salt is like anything with Bacon, it just tastes better, I will have to look out for these on my next grocery run!